The late President of the Republic of Poland, Lech Kaczyński, will be commemorated on the initiative of Electoral Action of Poles in Lithuania – the Union of Christian Families (EAPL-CFA). The fractions of EAPL-CFA in Vilnius and its region registered today draft resolutions on naming after Lech Kaczyński a wide and beautiful plaza at the Houwalt manor in Maišiagala and a street-square located at Gediminas Avenue in the center of Vilnius. During his first visit to Lithuania, President Lech Kaczyński, together with President Valdas Adamkus, visited the legendary patriarch of Vilnius – Prelate Józef Obrembski in Maišiagala on the eve of his 100th birthday anniversary. Maria Rekść, the mayor of the Vilnius region, said that apart from naming the square after Lech Kaczyński, the local government will also place a plaque commemorating the visit of the Presidents Lech Kaczyński and Valdas Adamkus next to the Museum of Prelate Józef Obrembski. As part of the upcoming celebration of the 100th anniversary of regaining Poland and Lithuania’s independence and in order to strengthen close relations between the two neighboring countries, the Vilnius fraction of EAPL-CFA presented today to the Council of Local Government a project regarding the decision to name the street-square at Gediminas Avenue after Lech Kaczyński. President Lech Aleksander Kaczyński (1949 – 2010), Lithuania’s great friend, Polish politician and lawyer, opposition activist in the anti-communist party, president of Warsaw, chairman of the Supreme Chamber of Control, minister of justice, associate professor of the University of Gdańsk and Cardinal Stefan Wyszyński University in Warsaw, President of the Republic of Poland in the years 2005-2010. 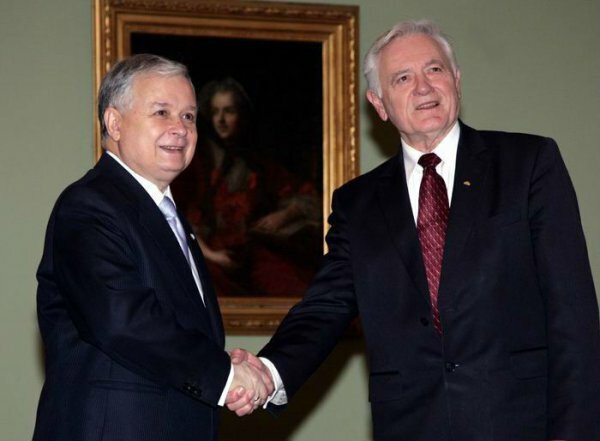 The President of the Republic of Poland Lech Kaczyński, together with the President of the Republic of Lithuania Valdas Adamkus, promoted partnership relations between Poland and Lithuania, sought to regain sovereignty, jointly strengthened the regional command of states, and encouraged mutual understanding between Lithuanians and Poles. President Lech Kaczyński was a great friend of Lithuania and a lover of the Vilnius region. The former leader of Poland visited Lithuania 16 times (in the years 2006-2010), each time visiting the Vilnius region. Decisions on the commemoration of Lech Kaczyński at the Meeting of the Local Government Councils will be adopted on January 26 in the Vilnius region, and on February 7 in Vilnius. The “Waldemar Tomaszewski’s Block” fraction of EAPL-CFA in the Vilnius region unites 21 councilors in the 31-member Local Government Council, and 10 councilors in the 51-member Council in Vilnius.